See View Log Files (Oracle ILOM) for examples. Active service processor failed: If the active service processor fails, it becomes the standby service processor (while the former standby service processor becomes active). Replace the standby service processor. Go to Step 5. Standby service processor failed: Go to Step 5 to replace the standby service processor. Both service processors failed: Go to Step 4 to stop all the hosts first. If you are uncertain: Go to Step 3 to check the /SP/logs/event/list. Use this command only if both service processors have failed. If one service processor failed, go instead to Step 5. 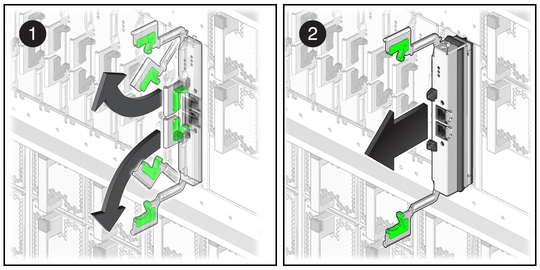 In approximately two minutes, this step halts the service processor, turns off the service processor OK LED, and lights the Ready to Remove LED. Verify that the service processor is stopped. Locate the lit blue Ready to Remove LED. The service processor is at the front of the server. Label and disconnect the cables attached to the serial and network ports. Serial management is the upper port. Network management is the lower port. Squeeze the locks on the extraction levers. Swing the extraction levers into the horizontal position. Pull the service processor out of the slot. To replace the battery, see Replace a Service Processor Battery. To install a service processor, see Install a Service Processor.